This is the first scientific journal to specialize in fungal ecology. 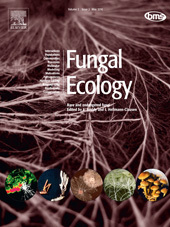 The scope of the journal is broad, and publishes articles on all aspects of fungal ecology, including the following (not exclusive): population dynamics; adaptation; evolution; role in ecosystem functioning, nutrient cycling, decomposition, carbon allocation; ecophysiology; intra- and inter-specific mycelial interactions, fungus-plant (pathogens, mycorrhizas, lichens, endophytes), fungus-invertebrate and fungus-microbe interaction; genomics and (evolutionary) genetics; conservation and biodiversity; remote sensing; bioremediation and biodegradation; quantitative and computational aspects - modelling, indicators, complexity, informatics. The usual prerequisites for publication are originality, clarity, and significance as relevant to a better understanding of the ecology of fungi. As well as the usual original research papers, Fungal Ecology publishes Mini Reviews (about 3500 words) and Commentaries, Short Communications (less than 1500 words) - not interim reports nor reports of new species or species lists, and Methodological Advances that describe the development of tools for studying fungal ecology. Such tools include microscopy, molecular, genetic and computational/modelling methods. All articles are peer reviewed. The first issue of the journal appeared in spring 2008, and after a slow start during the first year now receives plenty of high quality articles. The size of issues is now increasing (originally 50 pp.) to over 70 pages in issues 3 and 4 of 2010. There are currently 4 issues per year, but this is likely to increase to 6 in the near future. The journal is abstracted in ISI Web of Knowledge and has just received its first Impact Factor, 0.895.This is really gratifying as it is unusual for a new journal to receive an IF so soon after its inception, and we hope to see a rapid increase in IF. The success of any journal relies on the quality of its contributions, and therefore we invite you to submit your high quality manuscripts on any aspect of fungal ecology to the journal. There are no submission fees or page charges. Submission to this journal proceeds totally online. The journal has an international editorial board with a wide breadth of interests. Vol 2, Issue 4, 2009, Pp 149-159. Vega et al. Volume 1, Issue 1, 2008, Pp 4-12 Baldrian, P.
Volume 2, Issue 1, 2009, Pp 21-30 Teste, F.P. , Simard, S.W. & Durall, D.M. Volume 1, Issue 2-3, 2008, Pp 69-77 Clément-Mathieu, G. et al. Volume 1, Issue 1, 2008, Pp 13-18 Kearns, S.G. & Bärlocher, F.